Supreme Court Sides With Samsung, Against Apple In Patent Infringement Fight : The Two-Way The unanimous decision means that if Samsung swiped the design for one part of a phone from Apple, it may not need to hand over profits from the entire device. The case goes back to a lower court. A Samsung and an Apple smartphone are displayed on Aug. 6, 2014, in London. 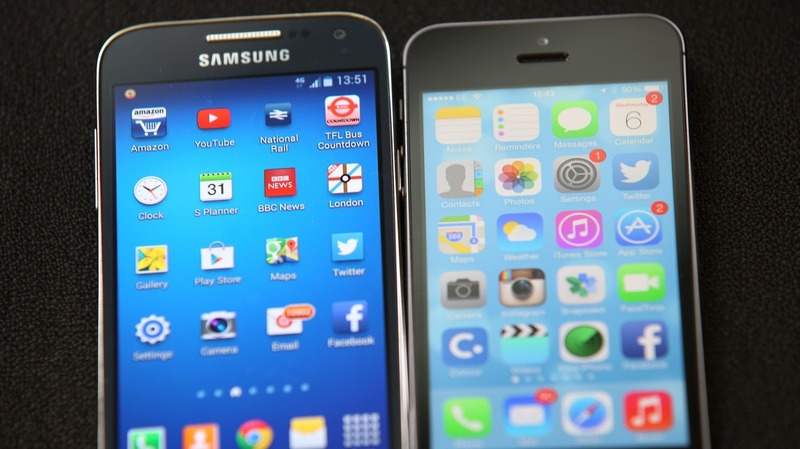 Samsung previously had been ordered to pay Apple $399 million in damages. The high court's unanimous decision sends the suit back to a lower court to reconsider what is a reasonable amount. "The two smartphone giants have been battling each other — not just in the marketplace but also in the courts — since 2011, a year after Samsung unveiled a new set of smartphones, including the Galaxy. Like iPhones, the Samsung products, for the first time, had rounded corners and square icons on a touchscreen. "Apple alleged, in part, that its South Korean rival had infringed three design patents for discrete components of the iPhone — the front face of the device, the rounded edges framing the face, and the device's distinctive matrix of colorful square icons. "In 2012, a jury ruled in Apple's favor and Samsung was ordered to pay $399 million in damages — all the profits it had made on 11 infringing phone models. "Samsung appealed, arguing that it should not have to fork over its total profits; rather, it should only be liable for the specific design elements it infringed. The Supreme Court unanimously concluded that the "article of manufacture" doesn't have to be the entire phone. As we reported in May, Samsung has said the laws that govern copyright infringement like this were outdated and due for re-examination. The South Korean tech giant noted that the logic behind the $399 million decision would apply even if an 18-wheel tractor-trailer included design infringement in a single cup holder. "In its opposing brief, Apple counters by arguing that the law 'could not be clearer': It explicitly holds an infringer liable for the 'total profit,' and not just a portion of it." In the end, the highest court in the land released a very brief decision that turned largely on definitions. The Supreme Court, citing multiple dictionaries, concluded there was no reason why an "article of manufacture" couldn't be a component, as easily as an entire product.